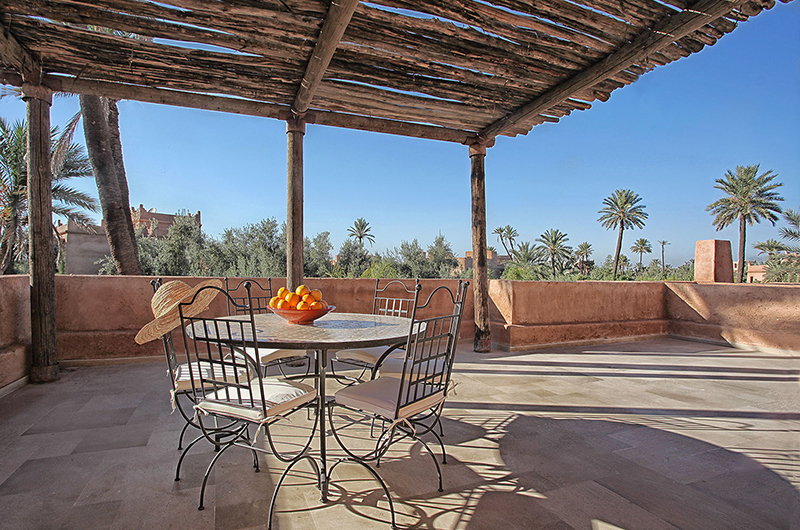 Villa Lankah evokes the feel of 1001 nights with its exotic Moroccan decor and dreamy gardens dotted with palm trees. Villa Lankah is an irresistibly sumptuous Moroccan villa designed to the nines and hugged by atmospheric gardens dotted with palm trees. Both the lavish living areas and the four bedrooms are decorated to delight the senses, with rich jewel tones, ornately carved doorways and a crackling fireplace glowing in the living room. 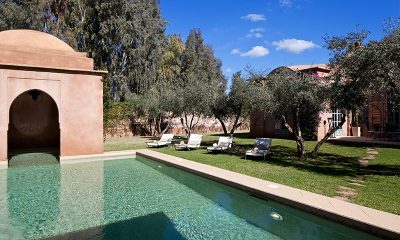 Villa Lankah is the perfect place to fall in love with Morocco, with the vibrant centre of Marrakesh just 10 minutes away. 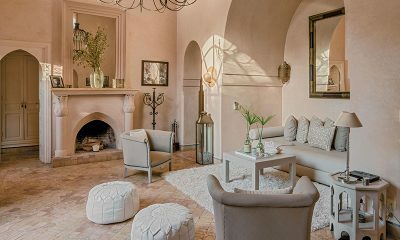 Villa Lankah’s rich interiors are decorated with designer furniture, opulent leather sofas and exotic Moroccan details. 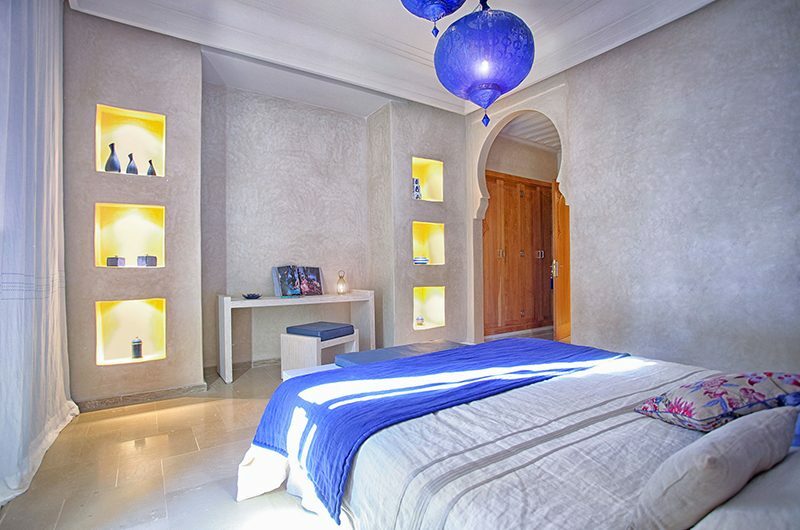 The property mixes modern design with traditional Moroccan touches visible in the arched doorways and the deep blue hues reminiscent of the blue city of Chefchaouen. 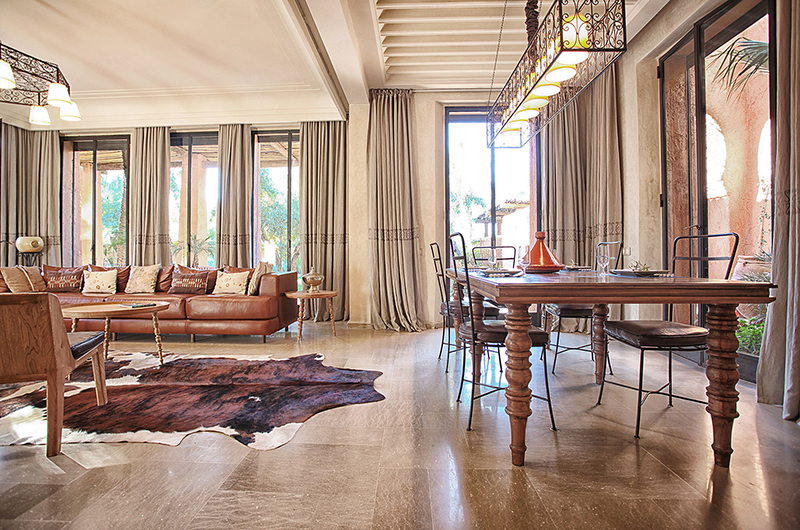 The living room is furnished with opulent leather sofas and a cowhide rug arranged around a beautiful open-plan fireplace. The room is lined with glass doors with allow the room to be flooded with light and views of the pool and garden. 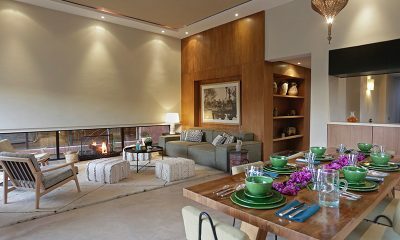 Villa Lankah’s dining area is built into the living room, with an elegant dining table easily seating the whole group. The dining area is lit up by a beautiful lantern lamp. Guests can also enjoy their meals outside on the poolside terrace. 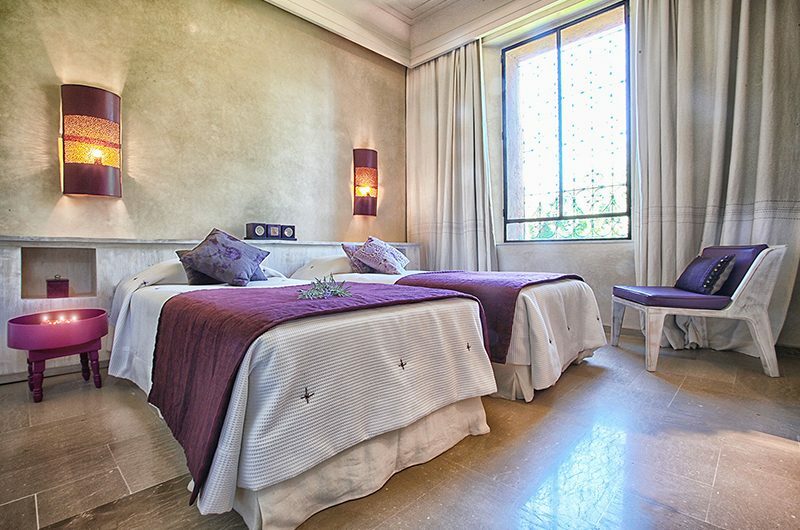 Villa Lankah is hugged by enchanting gardens boasting majestic palms and delicate olive trees. In the centre is a 9 x 4 metre swimming pool which can be heated during winter. An outdoor lounge is furnished with a white sofa, armchairs and a low-slung coffee table. Villa Lankah has four bedrooms. Three rooms have king-sized beds and one room has two single beds. The first bedroom is located on the ground floor. The room has a king-sized bed, a TV and an ensuite bathroom with a shower. The second bedroom is also on ground level and comes with two single beds, a TV and an ensuite bathroom with a shower. The third bedroom is located upstairs and comes with a king-sized bed, a TV and an ensuite bathroom with a shower. The fourth bedroom is also located in its own pavilion. The room has a king-sized bed, a TV and an ensuite bathroom with a shower. 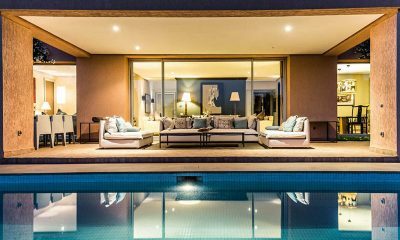 Villa Lankah is a two-storey villa housing four bedrooms with ensuite bathrooms, living and dining areas and multiple outdoor lounging spots flanking the 9 x 4 metre swimming pool. 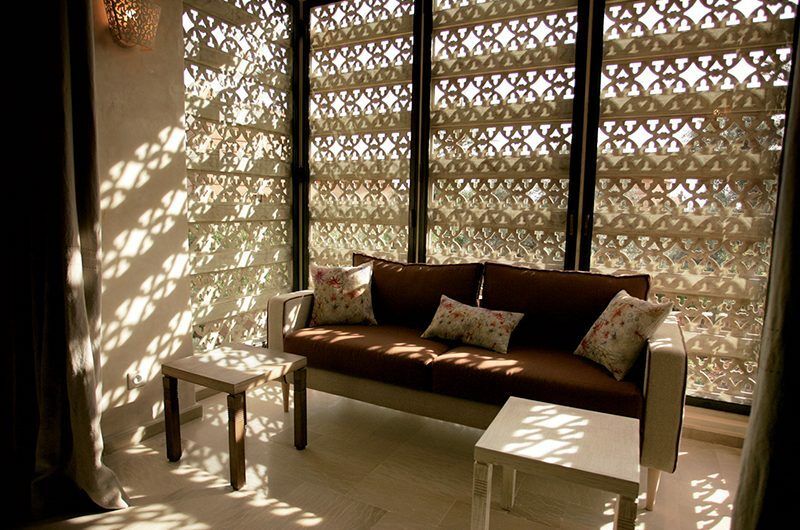 Your stay in Villa Lankah is made enjoyable by the professional staff. Villa Lankah’s staff have been professionally trained and will do their utmost to please with their warm and friendly hospitality. 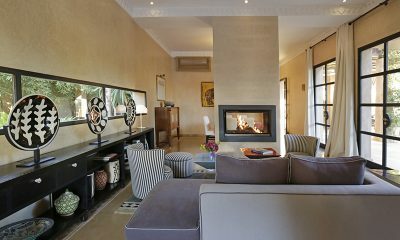 Villa Lankah’s experienced and knowledgeable manager is responsible for the overall operation of the villa. The villa manager will oversee and coordinate the staff and property and assist you during your stay. You didn’t think you would be expected to clean while enjoying time off did you? All of our villas include housekeeping to tidy up the villa, arrange the laundry services, wash up and simply make sure you don’t lift a finger whilst on holiday with the family. Butlers are on hand every day to assist with serving during meal times and attend to other guest requirements throughout your stay. Villa Lankah offers half board and all inclusive dining packages. The half board option includes a full breakfast and lunch or dinner. The all inclusive option includes breakfast, lunch and dinner. 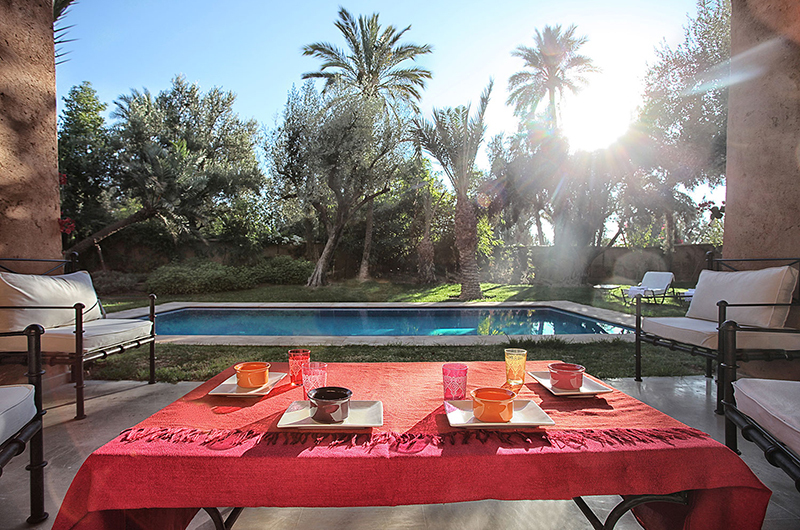 The villa offers a suggestion menu mainly focusing on Moroccan cuisine and special diets can also be accommodated. Villa Lankah includes 24-hour security. 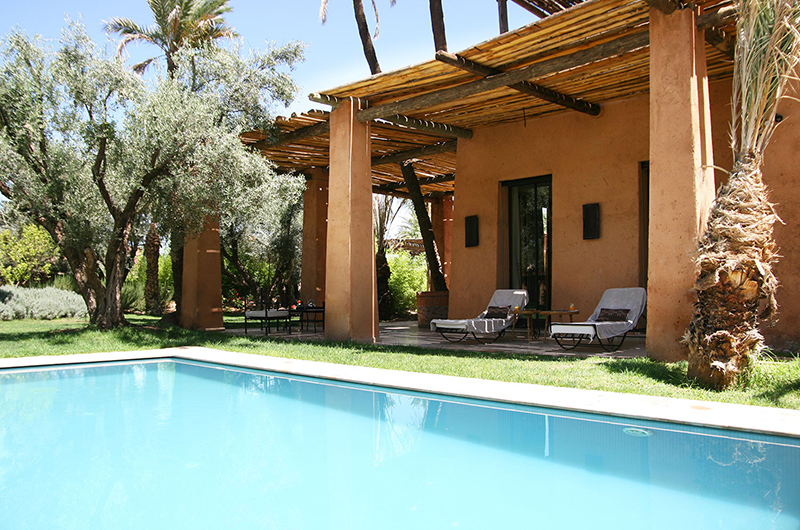 Villa Lankah is located on the outskirts of Marrakesh, Morocco, only a 20-minute drive from the centre of the city. 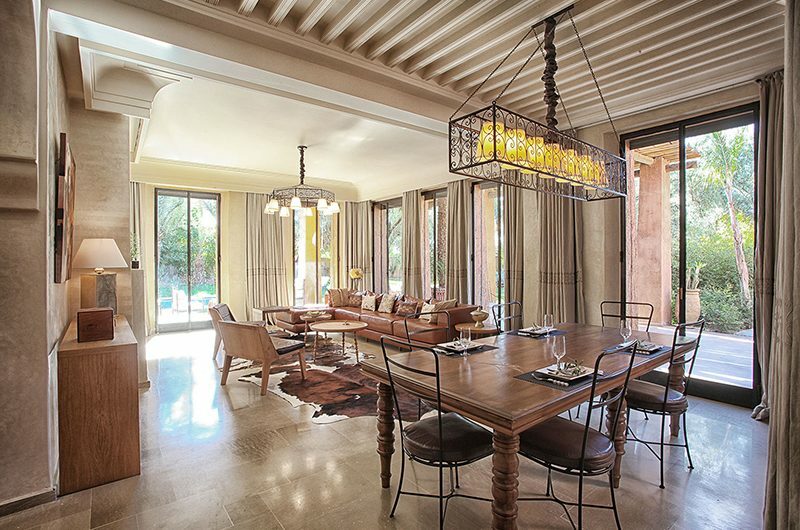 The property is a part of an exclusive and secluded estate in the Palmeraie palm grove. The historical hub of Marrakesh can be reached within a short drive from the villa as well as numerous great restaurants dotting the city. 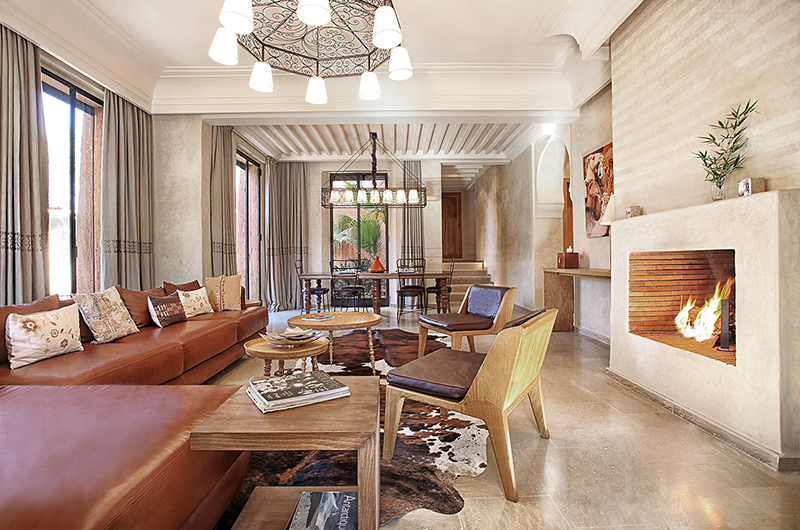 Sleek, chic and sophisticated, Villa Al Maaden 132 enjoys sweeping views of the Al Maaden Golf Course in Marrakesh. 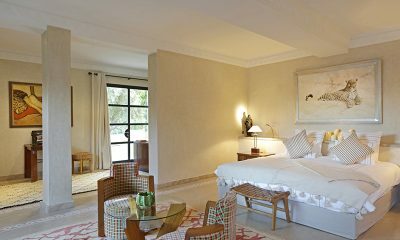 Stylish and streamlined Villa Jardin Bleu offers a calming Zen retreat and high design on the peaceful outskirts of Marrakesh. 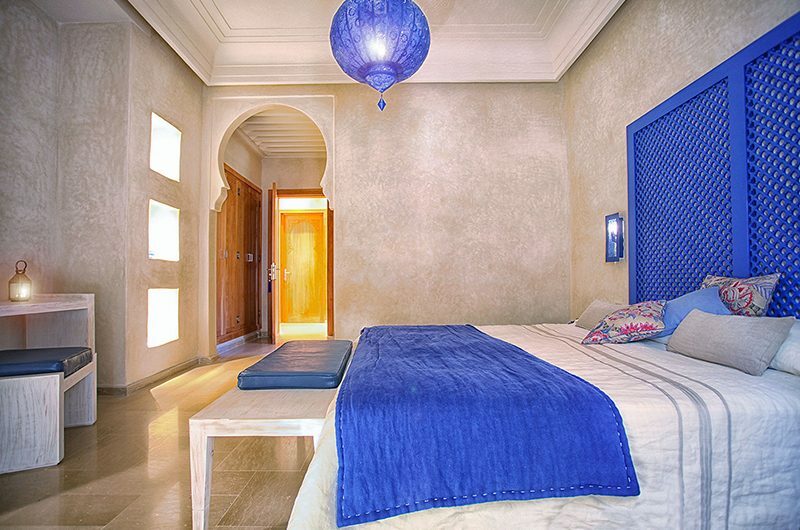 Villa Dar Tifiss combines exotic Moroccan charm with modern style, shaded by palm trees and adorned with eclectic art. 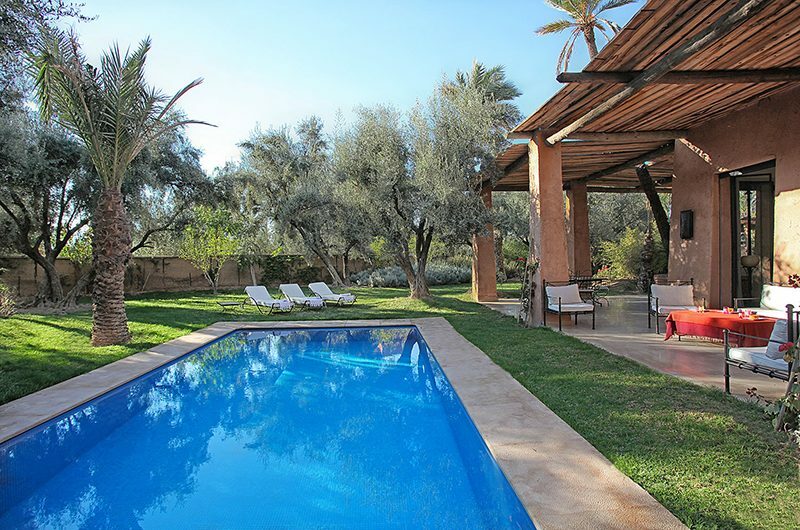 Villa Akhdar 3 brings a touch a Provence to Morocco, located within a luxury estate with a tennis court and spa.